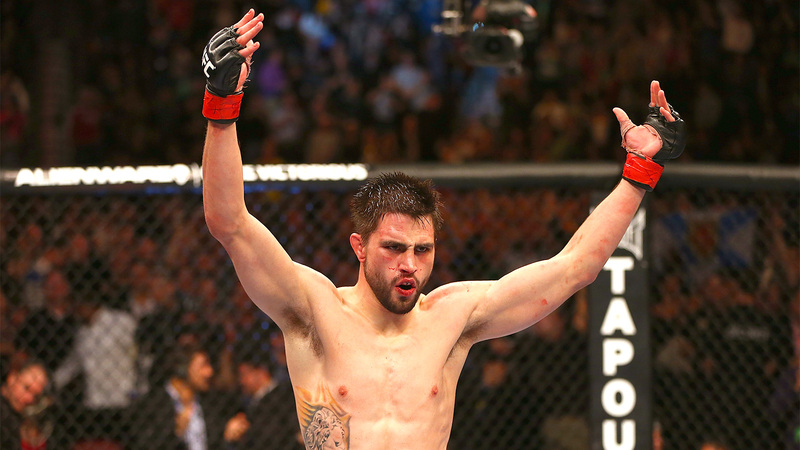 Carlos Condit received some good news and some bad news on Saturday night. The bad news was a potential rematch against Nick Diaz won’t happen at UFC 171 after the Stockton fighter turned down the bout after speaking to UFC president Dana White in Sacramento at the UFC On FOX 9 card. The plan was to pit Condit against Diaz in the co-main event of UFC 171 in a card headlined by the new welterweight title fight with Johny Hendricks against Robbie Lawler. Fortunately as the No. 2-ranked welterweight in the world, Condit is still in a very advantageous position because he will still fight at UFC 171 and he can earn a title shot with a victory. Condit will fight on that card. I’ve just got to figure out who now. Asked point blank by FOX Sports following the conclusion of the UFC On FOX 9 post fight press conference when White was asked if Condit would be in a No. 1-contender’s fight, he simply answered, "Yeah." Now the mission becomes finding Condit an opponent, but as of yet the UFC hasn’t started searching because Diaz just turned down the fight a few hours ago. While several names could enter the fray for a fight against Condit, one fighter currently begging for the bout isn’t even in contention to land the bout. White says as soon as the announcement was made that Condit was going to need an opponent for UFC 171, former Strikeforce contender Tyron Woodley began text messaging him with a barrage of requests to land the fight. Unfortunately with Woodley still sitting outside the top ten, White says he’s not a viable option right now. "No, he’s not ranked," White said about Woodley facing Condit. White did go on to say some very complimentary things about Woodley, however, because following the conversation with St-Pierre on Friday where he was asking for an extended break from fighting and Diaz is turning down co-main event bouts against Condit, the UFC’s head honcho appreciates a competitor that literally asks for every big fight possible. "If Tyron Woodley texts me one more time — I’m not kidding you, I’m not being a promoter here, he must text me 15 times a day," White said. "Then once this whole thing went down with Georges St-Pierre, boom he wants every fight. ‘I’ll take any fight you want to give me’. Those are the guys I want to deal with. I love Tyron Woodley." As for Condit, he will go ahead and begin preparations to fight on March 15 in Dallas because he will still land on that card, but now the search is on for an opponent. Who that ends up being remains a mystery for now. "Condit will fight on that card," White said. "I’ve just got to figure out who now."